A year ago today, I was relaxing after a busy last few years and contemplating much of the same for 2018. As it turned out, I was right. Although I haven’t “rested up” from the whirlwind called 2018, and probably will not for some time, I must admit that it was a great year on all fronts and I couldn’t be happier. On the musical end, I did several key projects this past year. And more importantly, I made many new friends and contacts along the way. It is an honor and a privilege to know and work with them. The paranormal world was busy as well, with investigations, lots of behind-the-scenes research on some alternative and new-to-me areas of the field, several special guest appearances at conventions, a handful of radio interviews, three TV appearances, a musical guest appearance with the OrbTones (a rock band composed of paranormal researchers), and some well-attended lecture and book signing events. To those who attended any, or some, of the events listed above, I thank you from the bottom of my heart. You (fans and friends) are the folks who matter, and are why I’m here and do what I do; you have my full loyalty. The paranormal activities and events are special in the same way that musical activities are special. They afford me the opportunity to meet many exciting people and make strong, lasting friendships, and offer me the privilege of being able to relate to, and learn from, those people. Having been in the paranormal field since 1978, I have seen the field recycle, reinvent, and redefine itself many times. Interest reaches a peak every five years, and then resets in the sixth year. 2019 will be the fourth year of the current cycle. Look for more great things; not only from me, but from others as well. We are only a year away from the very top of the roller coaster. Enjoy. Looking to the future, I first think of all the “new me” statements people make, especially on social media. Why? I mean, let’s reason together. How often does a new year—a predetermined date on a calendar—automatically and suddenly alter a person’s life and attitude? It doesn’t, except for rare cases when someone manages to keep their New Year’s resolution. A couple exceptions might come into play, however. I am looking at extending my efforts and research into an area that I feel would greatly benefit from it, but as with everything else, I look before I leap. And, I am still looking. I am also pondering some new and big paranormal opportunities that have recently been offered to me. (Side note: I will not discuss them, so please don’t ask). As good as the opportunities sound, I can’t lose sight of the fact that everything usually looks good on paper, but paper often amounts to nothing more than the proverbial “sheep’s clothing.” I must evaluate the opportunities very carefully, and wisely. But, most importantly, I would like to wish everyone a very happy, healthy, and prosperous 2019! Posted in author, Author Appearances, Author Interviews, authors, Bell Witch, Book Signings, Books, creepy, folklore, Ghost Hunting, Ghosts, Halloween, Haunt, Haunted, legends, Paranormal, Paranormal Investigation, Scary, Spooky, Storytelling, Supernatural, Uncategorized, Witches and tagged author appearances, authors, ghost hunting, ghost stories, ghosts, History, paranormal, paranormal investigation, spirits, spooky, storytelling, writers on January 1, 2019 by Pat Fitzhugh. On the grounds of the Bell School building and city park in Adams, Tennessee, a tiny and rustic house sits quietly, paying homage to a bygone era. For over two hundred years, her now rusty nails and withered logs have stood witness to the triumphs and tragedies of those who came before us. Some even say she holds secrets; if only those logs could talk. Posted in Bell Witch, creative writing, creepy, Demonic Possession, folklore, Ghost Hunting, Ghosts, Halloween, Haunt, Haunted, legends, Paranormal, Paranormal Investigation, Poltergeists, Scary, Spooky, Storytelling, Supernatural, Tennessee, Uncategorized, Witches and tagged Bell Witch, folklore, ghost hunting, ghosts, legends, paranormal, Tennessee on November 16, 2018 by Pat Fitzhugh. 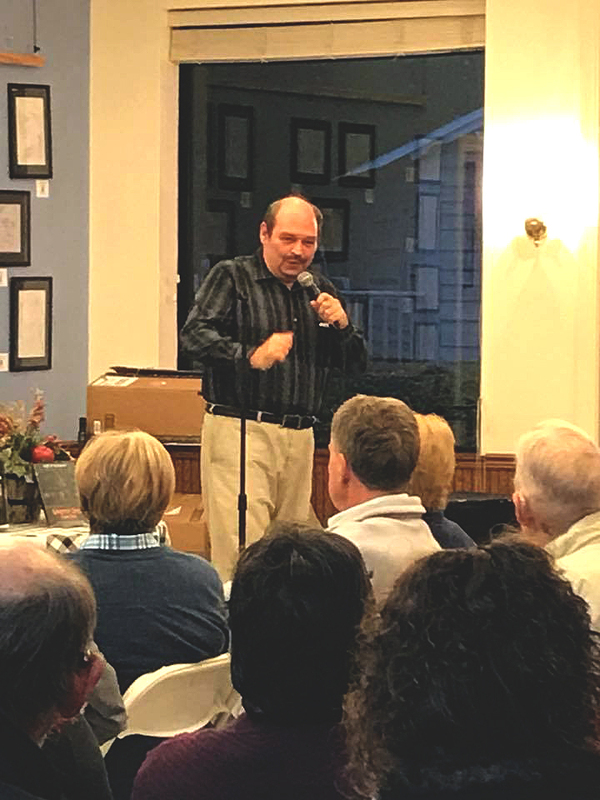 Had a great time in Brownsville, Tennessee, Friday night! 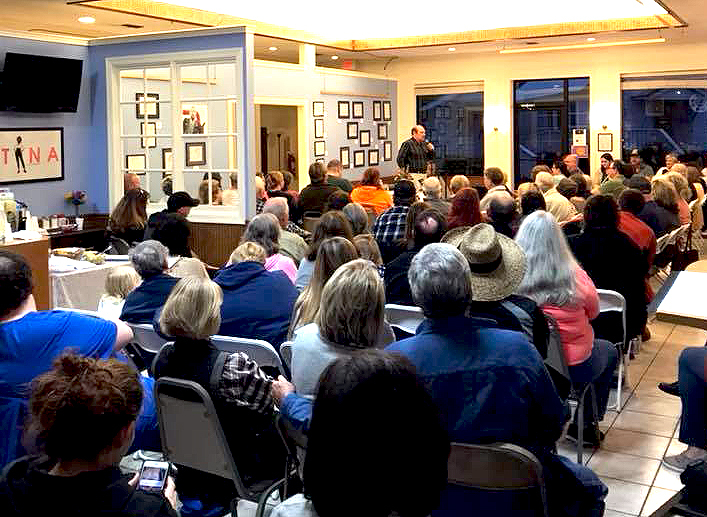 The weather was right, and the 120+ who came to the BELL WITCH lecture+QA+Signing event seemed to enjoy it. Thanks so much for coming out! It was also great catching up with old friends and ghost-hunting buddies I haven’t seen in a while (some of which drove from as far away as Mississippi and Arkansas to attend), and making some new friends as well. 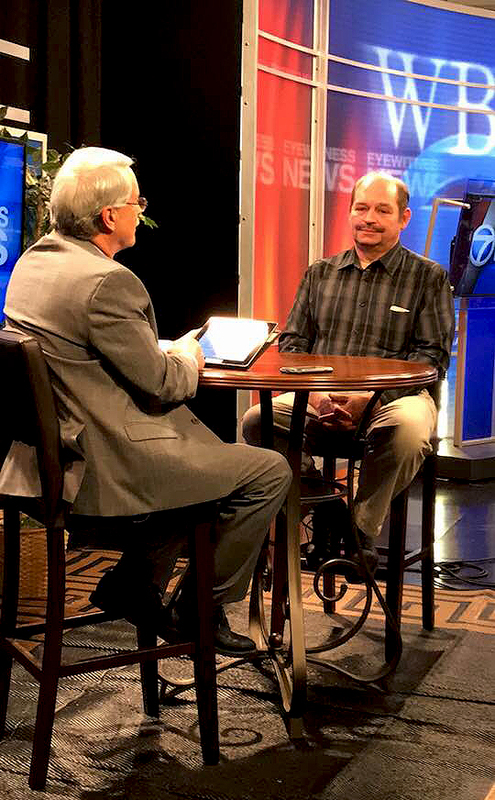 A big thank you to WBBJ TV in Jackson, Keith at WNWS, the crew at Radio Brownsville, and the supportive friends who helped to spread the word! And a VERY SPECIAL thank you to Sonia and her wonderful staff at the Delta Heritage Center for their hard work, professionalism, attention to detail, and rolling out this event with flawless execution! Posted in Author Appearances, Bell Witch, Book Signings, Book Tours, creepy, folklore, Ghost Hunting, Ghosts, Halloween, Haunted, legends, Paranormal, Scary, Spooky, Storytelling, Uncategorized, Witches and tagged Bell Witch, ghost stories, ghosts, Halloween, paranormal, scary, spooky, Tennessee Folklore, The Bell Witch: The Full Account on October 28, 2018 by Pat Fitzhugh. I will be meeting & greeting, autographing books, and giving two lecture presentations at the Arkansas Paranormal Expo. This will be held at the MacArthur Museum of Military History in Little Rock. In addition to guest speakers and vendors, the expo will host raffles for items such as a Ghost Hunt at MacArthur Museum, Gift Certificates, Gift Baskets, Books, Haunted Tours of Little Rock Tickets, and MORE! Admission is only $10 for a weekend pass, and is payable at the door. Children under 12 get in free. All admission, raffle and vendor fees will be donated to MacArthur Museum. Details (ticketing, speakers, vendors, hotel discounts, etc.) can be found at the Expo’s official web site. Come join me in Little Rock on Oct. 6&7 for lots of fun! 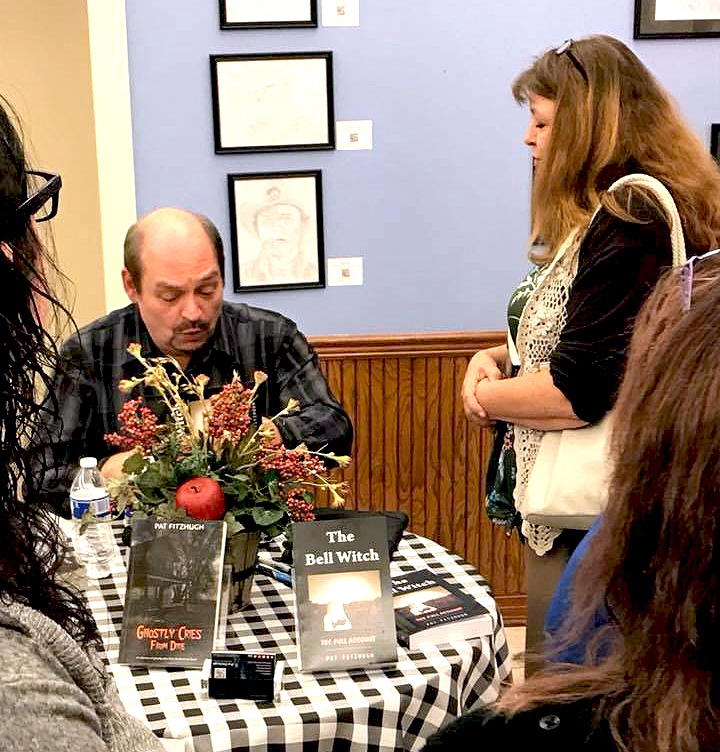 Posted in Author Appearances, authors, Bell Witch, Book Signings, creepy, folklore, Ghosts, Halloween, Haunted, legends, Paranormal, Paranormal Investigation, Storytelling, Supernatural and tagged Bell Witch, ghosts, Halloween, haunted locations, paranormal on October 5, 2018 by Pat Fitzhugh. With Clayton Trout at WEHC FM 90.7 in Abingdon, Virginia. We will be covering some haunted and weird cases from my book, “Ghostly Cries From Dixie.” Learn about The Greenbrier Ghost, Waverly Hills, The Bell Witch, Jacksonboro, The Brown Mountain Lights, The Bragg Ghost Light, and MORE! 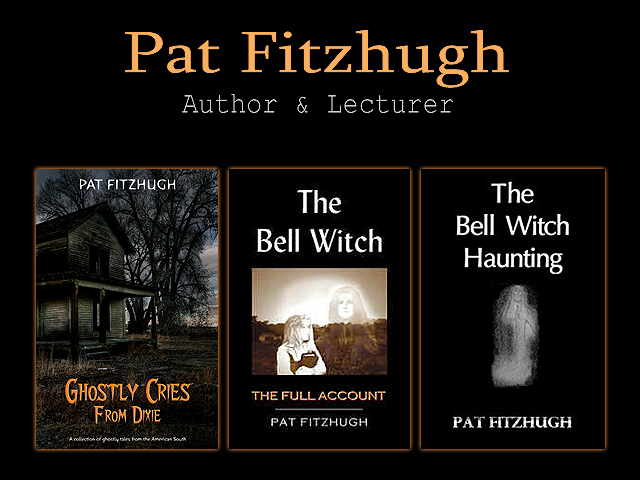 Posted in Author Interviews, Bell Witch, creepy, folklore, Ghosts, Halloween, Haunted, legends, Paranormal, Storytelling, Supernatural, Uncategorized and tagged folklore, ghosts, Halloween, haunted locations, legends, paranormal on October 4, 2018 by Pat Fitzhugh. I had a fabulous time at the MID-SOUTH PARANORMAL CONVENTION over the weekend. I performed with the Orb Tones, gave a Bell Witch lecture presentation, and signed books all weekend. It was also great to catch up with old friends and make lots of new ones. Great convention + great people! And, KUDOS to the LGHS for organizing yet another stellar, first-class convention! Stay tuned for MORE conventions and excitement later this year! Posted in Author Appearances, authors, Bell Witch, Blues, Book Signings, Books, creepy, Demonic Possession, folklore, Ghost Hunting, Ghosts, Guitar, Haunt, Haunted, Historical Fiction, Music, Paranormal, Paranormal Investigation, Spooky, Storytelling, Supernatural and tagged book signings, ghost stories, ghosts, Guitar, Music, paranormal, paranormal investigation, Writing on August 1, 2018 by Pat Fitzhugh. 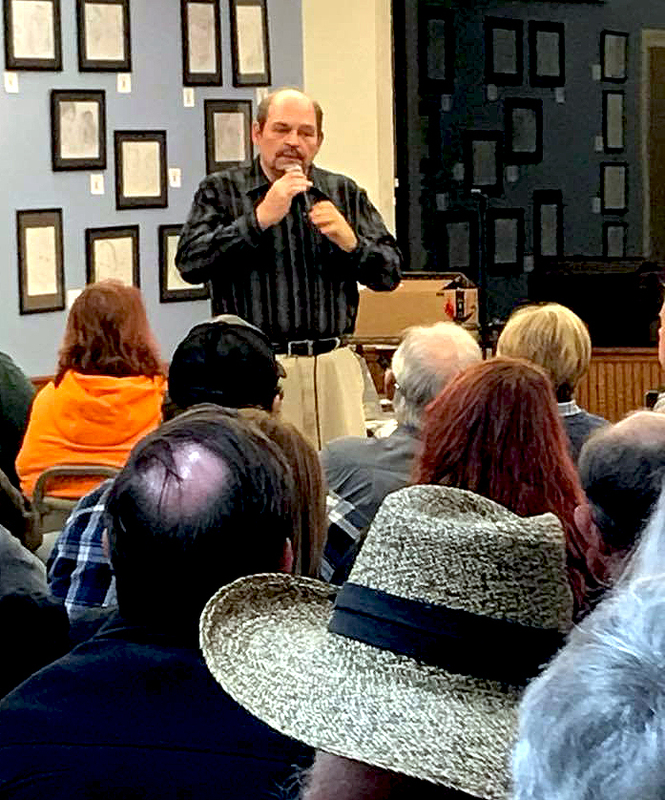 Also in the works for this year are several new paranormal investigations, writing projects, lecture and signing events at paranormal conferences and bookstores, and several guitar clinics. This year’s demand has been really high, and we are carefully monitoring the “para-scape” and working hard to finalize what’s in store for 2018! 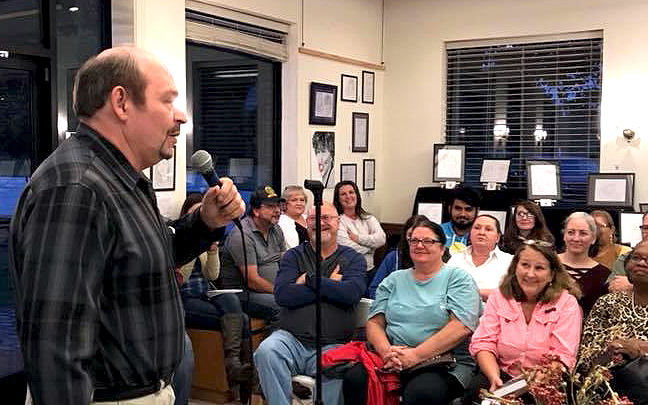 Posted in Author Appearances, folklore, Ghosts, Music, Paranormal, Paranormal Investigation, Storytelling, Uncategorized and tagged authors, folklore, ghosts, Guitar, History, Music, paranormal, paranormal investigation, spooky on April 15, 2018 by Pat Fitzhugh. 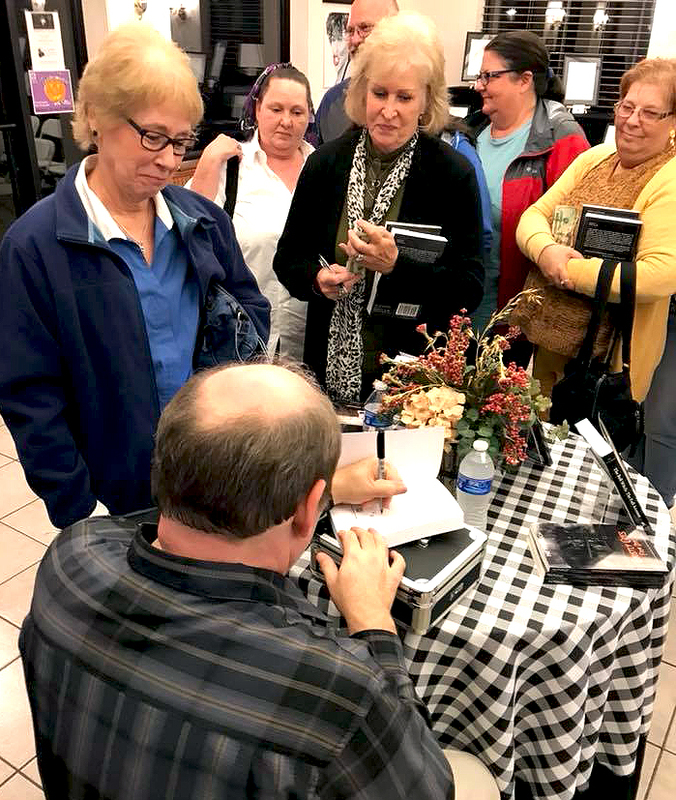 Many thanks to fans who braved the chilly weather to be a part of my storytelling and book signing events in Sparta, TN, yesterday and last night. I couldn’t have been more pleased with the turnout and everyone’s enthusiasm. As always, your interest and support are greatly appreciated; people like you are why I have been doing these and similar appearances for almost 40 years now. I hope you enjoyed yesterday’s events! We’ve only just begun. 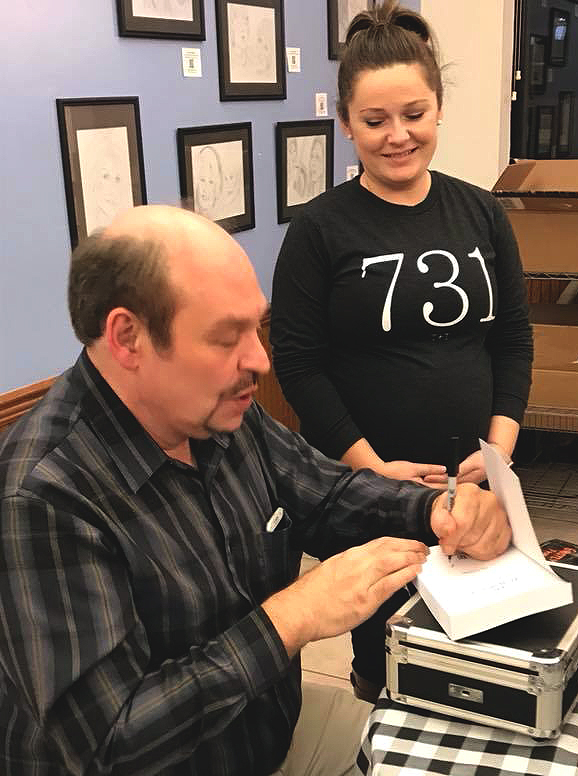 Posted in Author Appearances, Bell Witch, Book Signings, Books, folklore, Ghost Hunting, Ghosts, Halloween, legends, Paranormal Investigation, Prarnormal, Storytelling, Tennessee, Uncategorized, Witches and tagged ghosts, Halloween, History, legends, spirits, spooky, storytelling on October 29, 2017 by Pat Fitzhugh. 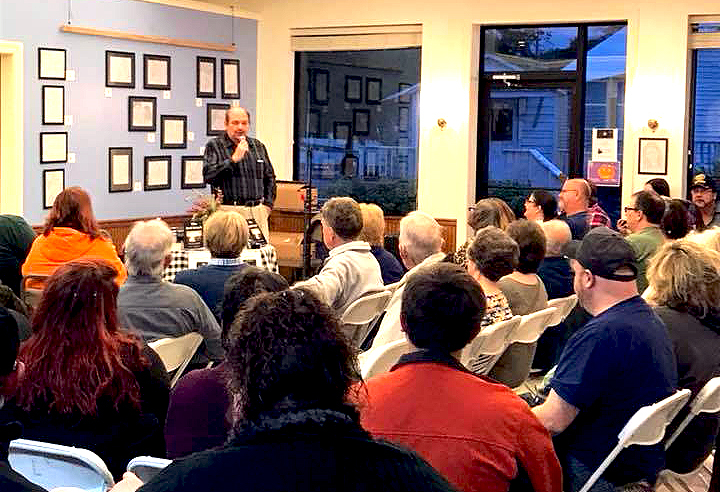 It has been a busy yet productive fall, winter, and spring, and new BELL WITCH-related lectures, books, and other items are on this year’s horizon! More on that in the coming weeks. This is, of course, in addition to several other projects I am currently working on. I will also be talking more about the Bell Witch development I posted recently, regarding an old, 1856 reprinted account of the BELL WITCH that recently surfaced, and its impact on a theory recently popularized by the skeptical community. 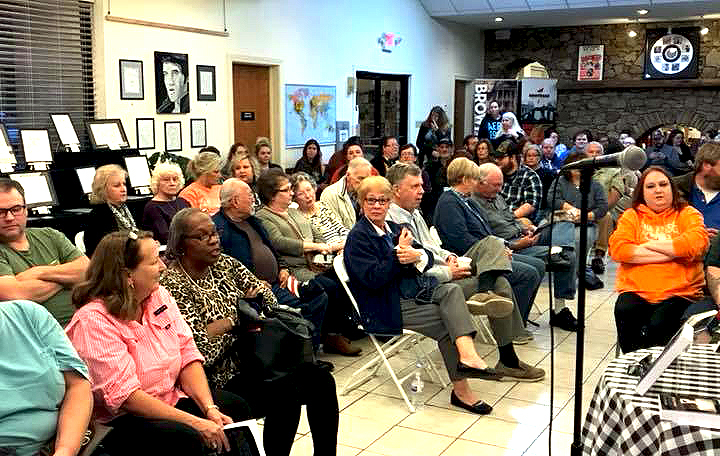 Meanwhile, I am leaving you with photos from two BELL WITCH lectures and storytelling sessions I did last fall–one in Sparta, Tennessee, and another at the McCracken County Public Library in Paducah, Kentucky. Enjoy. Posted in Author Appearances, authors, Bell Witch, Book Signings, Book Tours, Books, creative writing, creepy, folklore, Ghosts, Halloween, Haunted, legends, Paranormal, Poltergeists, Spooky, Storytelling, Supernatural, Tennessee, Witches and tagged author appearances, Bell Witch, book signings, Forthcoming titles, ghosts, paranormal, Tennessee Ghosts on July 15, 2017 by Pat Fitzhugh. As many already know, From Turkey Creek – A Memoir is a long-term work in progress. It is my childhood memoir of growing up at the most remote, fun, and wacky place in the world: Turkey Creek, in Humphreys County, Tennessee. This is a short, transitional chapter I wrote, which describes the “general stores” that dotted the countryside near Turkey Creek back in the day. Nearly every dirt road out in the country had a general store. Within an eight-mile radius of Turkey Creek, there was Nolan Sulley Grocery, Thomas Freeland Grocery, George Harris Grocery, Leonard Barnes Grocery, Clyde Rose Grocery, Harold Smith Grocery, Dudley Jones Grocery, and William Covington Grocery. Usually named for their retiree owners, these rural mom-and-pop institutions were the places where good country folk met, talked politics, and engaged in long, serious talks about the lack or overabundance of rain. Women bought what they needed and left; the men stayed and gossiped. Posted in authors, book promotion, Books, creative writing, excerpts, Historical Fiction, Storytelling, Tennessee, Writing and tagged amwriting, authors, books, creative writing, Forthcoming titles, historical fiction, southern culture, storytelling, Tennessee, Writing on July 10, 2017 by Pat Fitzhugh.